Happy Friday everyone! This Friday is the start of something brand new. Rather than stopping by with my Fancy Finds from the past week, I'll be sharing some love for my wonderful sponsors (check back next Friday for an extra dose of Friday love)! I'm so thankful to have a new shop on board who has shown some love and made what I do that much easier. So, for those of you who haven't already spotted them in my sidebar and paid them a visit, please show some love for my very first sponsors over at The Coaster Shop. Don't see anything in the shop that fits exactly what you are looking for - they'd be happy to do a custom order for you as well! What's better than that? Keep your furniture looking sharp, with pieces that fit your space and decor. Love what they're doing over at The Coaster Shop, and I'm positive that you will as well! Make sure to use the coupon code "firsttimefancy" to get 10% off your order! 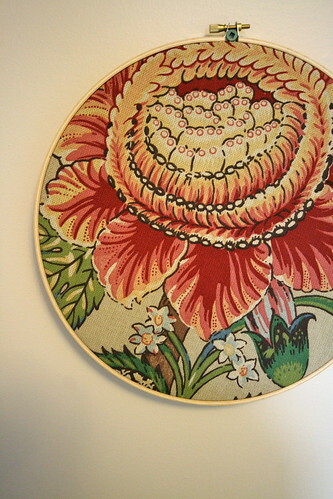 Keep your eyes open as well, as I've been promised that a number of new coasters will be making their way into the shop soon. Interested in becoming a sponsor here at First Time Fancy? Check out my Sponsorship page for more information, or shoot me an email if you have any questions! I'd love to have you! On Sunday, B's parents arrived. The first of a parade of visitors arriving until the end of September. We're really looking forward to showing our family and friends a lot of the places that we love out here, along with some places that we've never seen before. We have already made a few trip's out here on our own. 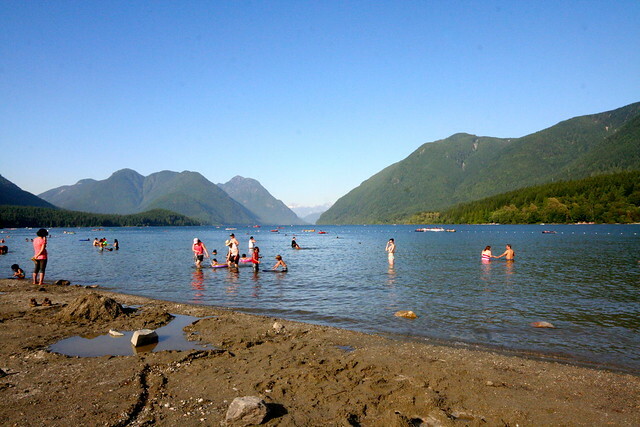 Once with our first visitor from NYC, and the second time about a month ago, to swim at the lake and cool off. Of course, the park is HUGE (62,450 hectares to be exact), so we have barely scratched the surface. Actually... we have only been to Lake Alouette. This means, that of course we would love to bring some of our more adventurous guests to this gorgeous park for some walking, hiking and general nature loving. I mean, isn't that why people come to B.C. in the first place? I actually brought B's parent's here on Monday afternoon for a stroll with Halle. 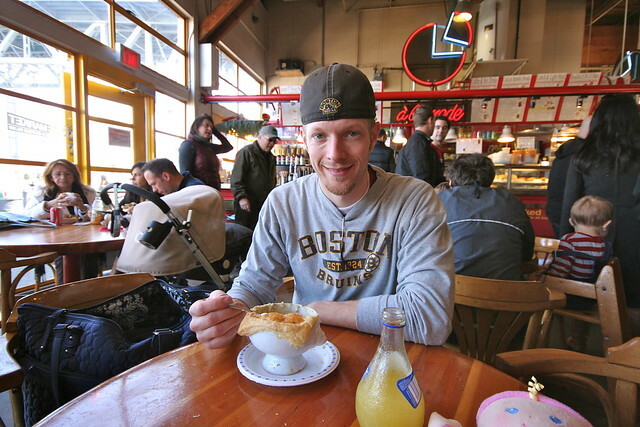 B has never been with me, but I visited once before when meeting Colleen and Kevi for an afternoon coffee. I'm so glad Colleen had me visit that first time, as it was a great place to visit with B's parents. We walked through all of the lovely shops, and discovered a few gems that I plan to go back to. It's such a nice little place to get out to, and though we didn't actually visit the historic fort, we enjoyed an afternoon walking the shops. We'll have to save visiting the Fort for another day. 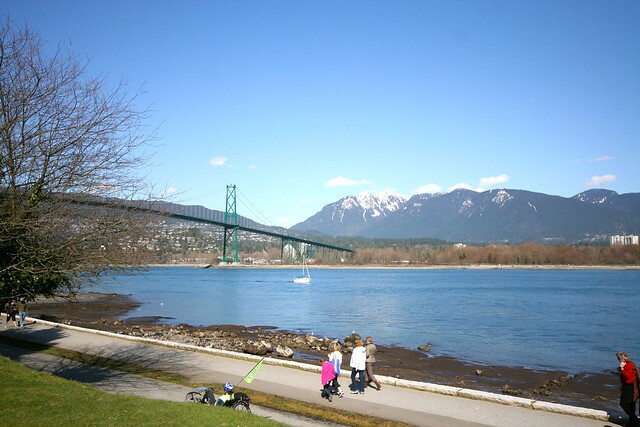 I don't think it's possible to bring someone to Vancouver and NOT bring them to Stanley park. After all, it is considered one of the greatest urban parks in the world. So far all of our visits have been limited to driving around the seawall, stopping only briefly to take photos, but I am determined that at one point this month we will park the car and venture into more of this beautiful green space to explore with Halle. I know that she, along with our guests, will enjoy running around and taking in all of the lovely sights this space as to offer. I have never seen anything quite like it - the trees, the ocean, the mountains - absolutely stunning! B has been up Cypress a couple of times. His first time was skiing, when he was out here for the first time in March, and we made the trip up to the look-out point when my friend came to visit back in June. 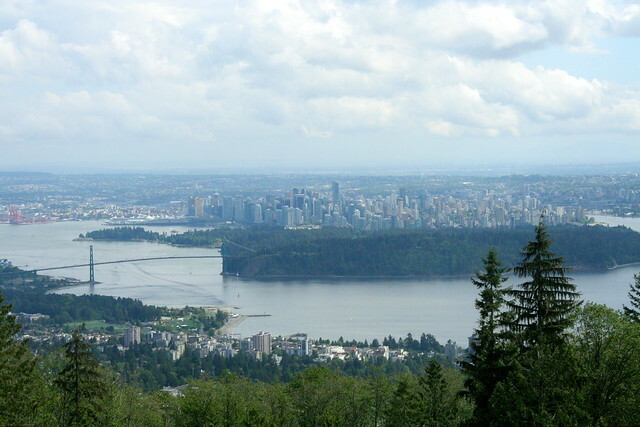 It's the perfect place to head to on a clear day, to get a fabulous view of Vancouver and much of the surrounding area. I do hope that we can head up there with at least one of our visitors during the month of September. We visited the Aquarium during our first trip also. 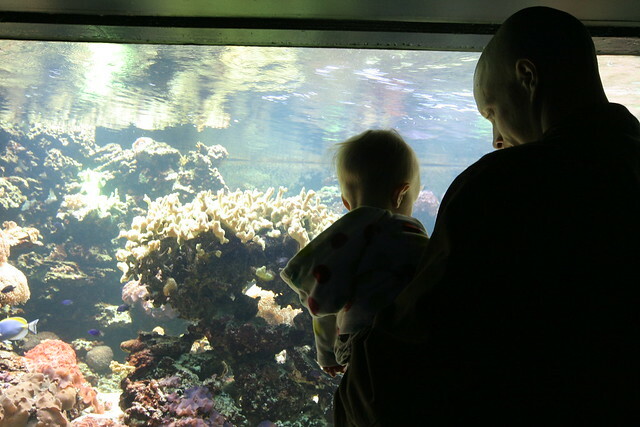 Halle may have only been 8 months old at the time, but even she loved watching all of the fish and other animals that reside at this incredible aquarium. It was the perfect day to spend a cool, rainy spring day, and I can't wait to bring her again. It would be nice to visit with some of our guests, but we'll see who is interested. This is definitely the type of destination one should have an interest in visiting, and be willing to commit at least a couple of hours to. 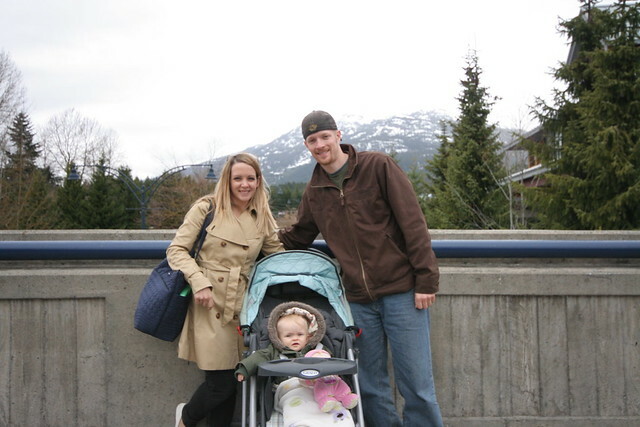 We made the trip to Whistler not long after moving here, and I have been looking forward to going again. Our first trip was pretty short, since we arrived around lunch time, ate and walked around the village for maybe an hour before making the drive back to our home. We hope to bring B's parents this weekend to check it out. It's a great place to explore, but even the drive there is worth it. I hear the Sea to Sky highway was not much of an enjoyable ride before the Olympics, so I'm thankful we moved when we did. The drive that first time was breathtaking, and I look forward to experiencing it all over again! Hope, I learned, is somewhere you would bring a guest who is interested in exploring more of the great outdoors. 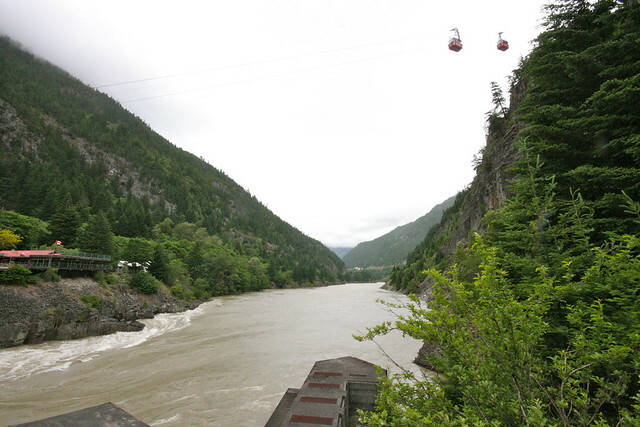 When we visited we went on the Hell's Gate tram and also paid a visit to the Othello Tunnels. It was pretty cool and rainy, so neither excursion lasted as long as we would've liked, so I'm looking forward to heading back on a nicer day. I have a feeling my brother would really enjoy checking out Hope, so even if no one else is interested, I plan to take him there for a visit when he's out west. 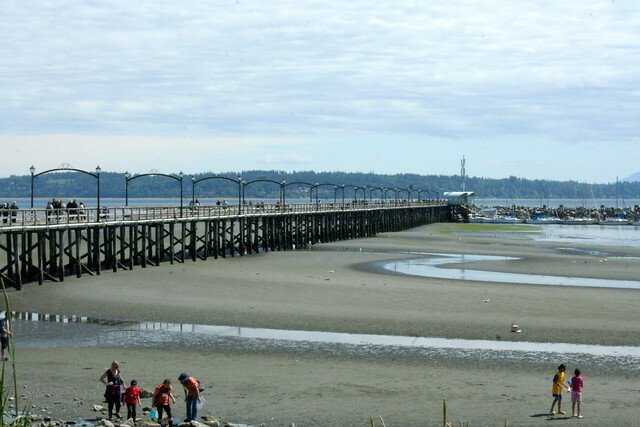 White Rock is another one of my favourite close-to-home places to visit... especially if you're in the mood for ice cream... or cupcakes! We stopped by here on Tuesday, and enjoyed a walk on the pier as well as a stop for an afternoon snack at Tracycakes Bakery. 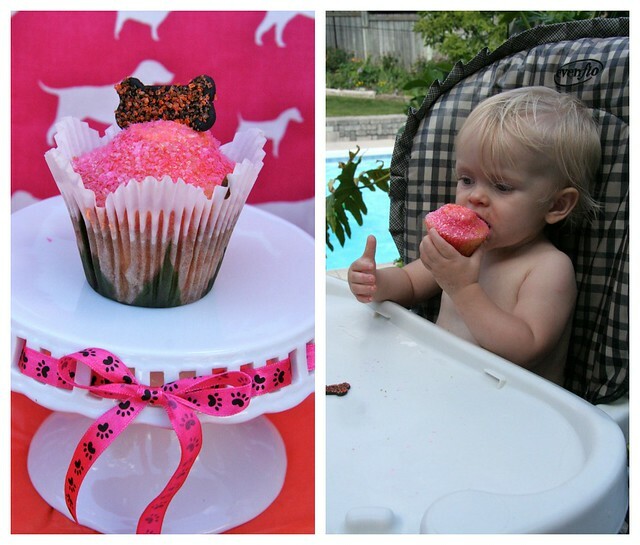 A warm drink and a sampling of cupcakes - what could be a more perfect day than that? I'll definitely be bringing each of our guests back to White Rock... if nothing else, at least for an afternoon cupcake run! I have a feeling that a lot of people from Vancouver would tell you that GasTown is pretty touristy... but hey, I like it. We've only been when bringing friends. Our first visit was short, only for an enjoyable brunch with a friend of mine on the patio, back in June and most recently we spent some time strolling the streets, slipping into some lovely shops and enjoying some dinner, with B's parents. We even spotted James Hetfield of Metallica enjoying lunch at one of the restaurants. I think it's a fun way to spend some time in downtown Vancouver, and I'll probably bring at least a few more of our guests to check it out. I have been anxious to visit Victoria for so long, and B had even looked into us going to visit when we were on the island last month. Well, we finally booked our ferry for this Sunday, and we'll be heading over for a visit with his parents. It's just for the day, but I'm incredibly excited to see this beautiful location! Watch for a post on our adventure next week. 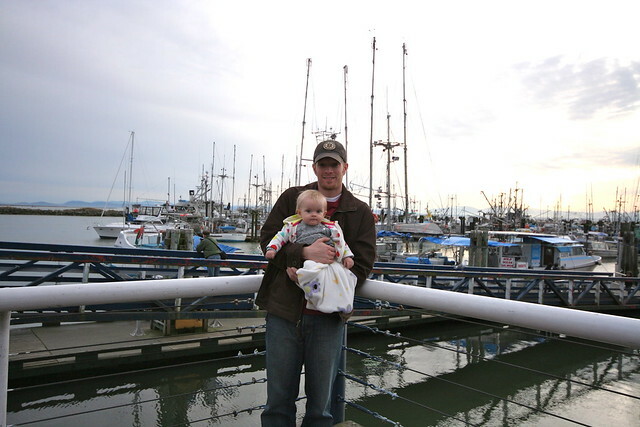 B and I first visited Steveston when we came out to Vancouver in March. We loved it immediately, especially because of the food choices here. Steveston is a historic fishing village, right off the coast and we're happy to go there any time for BBQ or seafood... or cupcakes or whatever seems to strike our interest at the time. I actually swung by here with B's parents yesterday, and we enjoyed lunch and picked up some fish (right off the boat) for dinner tonight. I love visiting here, and have high hopes of going Whale Watching out of Steveston one day. Considering how close Seattle is to us, I am surprised I have not yet convinced B to head there yet - even just for a day trip. This is another location I am determined to visit during our month of visitors. Visiting the original Starbucks, strolling Pike Place Market, seeing the Space Needle - I want do to it all! What do you suggest we do when we visit Seattle? Another rather touristy, but enjoyable destination. We actually started B's parents visit here, and we all enjoyed our time here. A delicious lunch, a nice stroll and purchasing some yummy beer. Since we always love food when we travel, we figure it's a good place to bring people. Whether we're ready for a bite to eat right at that moment, or just interested in picking up a snack or something to cook up for later, it's a great place to visit. I always love stopping by here. What do you think of our list of places to bring our visitors? Is there some place else that you would add, or ask to visit if you were heading out west to see the sights? We're always happy to add more to our list, and I'd love to hear some of your suggestions and tips for travelling around the West Coast. I must say, after yesterday's post on making some changes to Halle's nursery, I was itching to get started. Of course, I will be trying to make these changes on a shoestring budget, so for now I have to start small. While we were out and about yesterday, my mind started turning and coming up with ways that I could make some changes on the cheap. Art can always be the cheapest way to go so I immediately went to that. If you follow me in instagram (firsttimefancyblog), you would have seen that last week B and I finally got some more artwork up on Halle's wall. I never shared it on here, since it was exactly the same as what we hung in Toronto, and I knew that some changes would eventually be coming. I think this was the perfect way for me to get started on changing up Halle's space - especially since it was absolutely FREE! B was pretty happy about this as well! For now, I'll continue to try to shop our home to make changes, and in time share with you the process of her how her room is coming along. Of course, we still have a lot of time with guests coming up, but I'll do my best to keep sharing what's happening! For the time being, if you are interested in what we are getting up to everyday, you can follow along on Instagram. Find me over at firsttimefancyblog. Have you been making any small changes around your place by shopping your home? Happy Tuesday Friends! I had a bit of a disappearing act yesterday. I know it happens rather frequently, but we've been busy catching up and showing B's parents around. They arrived on Sunday, so things have been pretty crazy (in a good way) around here. BUT, today I am back with a bit of an inspirational post! 1) "Let Her Sleep For When She Wakes, She Will Move Mountains" Print - $20.00 by Yellow Button Studios: I think this print is sweet, from the words to the colours it is exactly what I would like to add to her little space! The price isn't too bad either, in my opinion. 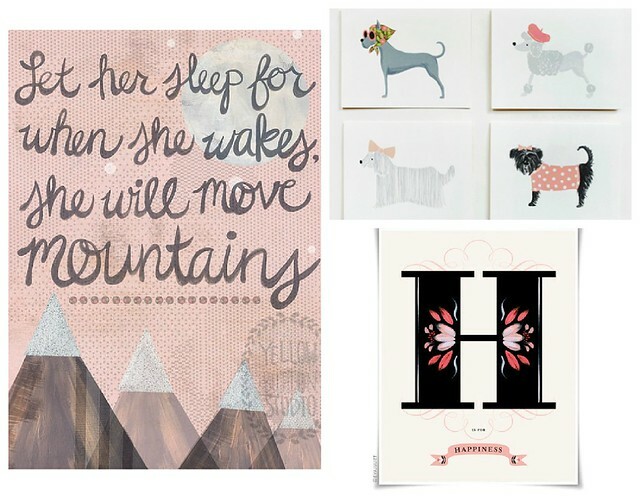 2) Assorted Girlie Dog Set - $18.00 by Rifle Paper Co. - Alright, so they aren't prints, but these sweet little dog cards would be perfect to frame in Halle's room. 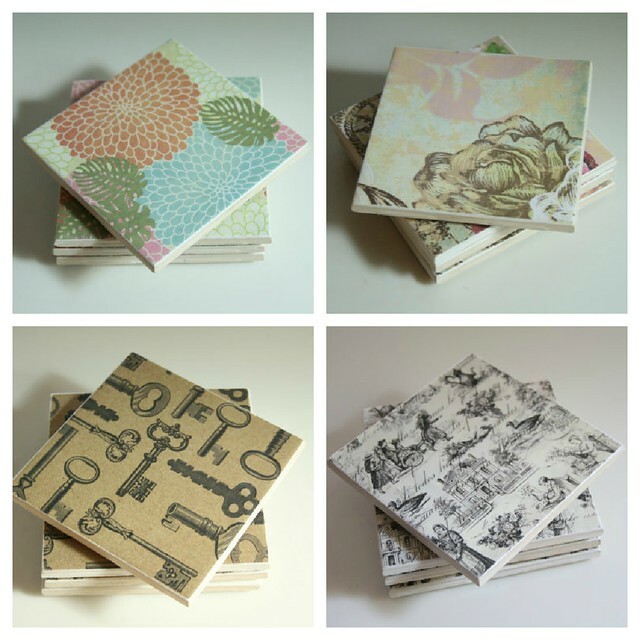 There are two of each card in a pack, so four can go on her wall, and four can be saved for stationery. I just knew, as soon as I saw them, they would be the perfect addition to a room for our dog loving girl. 3) H is for Happiness art print - $25.00 by Evajuliet - I shared this print before on one of my Fancy Friday Love posts. As you can tell, I do really, really love it. It can also be personalized, so I think I would have it changed to H is for Halle. What a perfect piece our baby girl could keep forever! Accessories will probably be the easiest way for me to begin the transition. 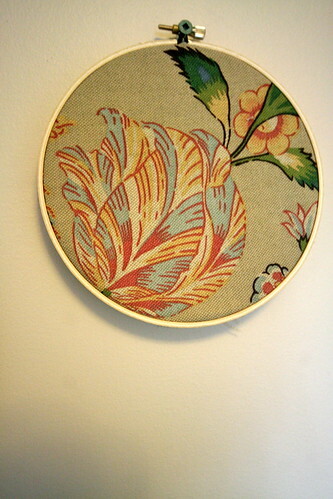 While I start on the walls, I will continue to look for the right throw cushions, curtains and other pieces. 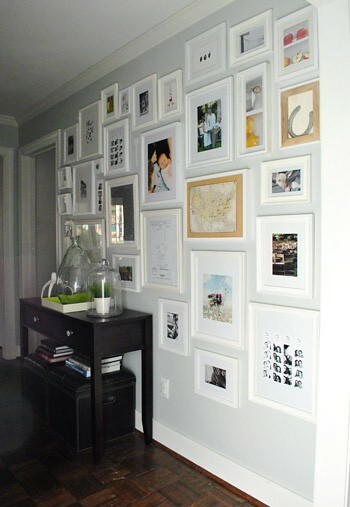 As much as I love all of the sentimental pieces in her room, I just think I need a change. 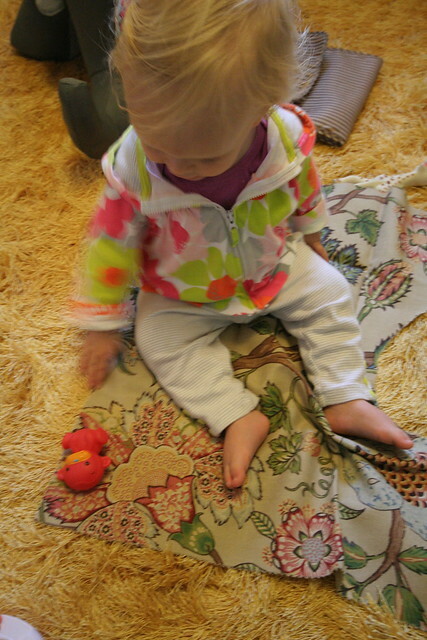 We're in a new place and Halle is growing so quickly, into quite the girly girl. Don't expect a huge makeover, or major reveal - but some little tweaks here and there as I find the pieces I love for a great price. Are you planning to make some small switches or adjustments to any rooms in your home for the coming season? Adore this blue cottage, found on Verdigris Vie on Monday. Wouldn't it be a lovely place to spend these last precious days of summer? 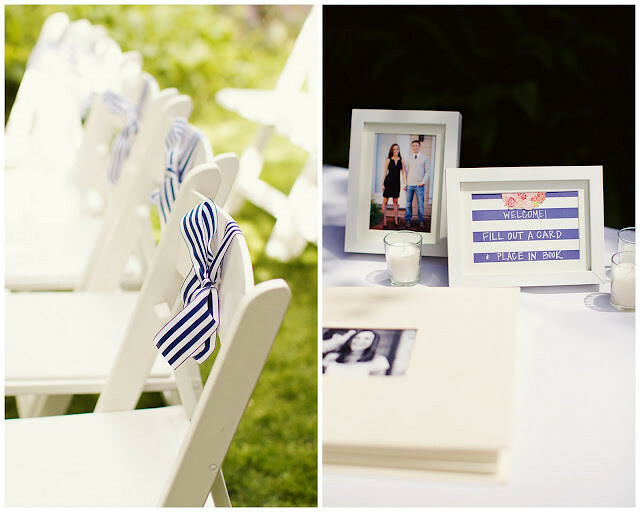 Carlee has been sharing details of her wedding, over on her blog. It all looked so perfect, don't you agree? I found the perfect inspiration for Halle's big girl room (not that we're ready for a big girl room quite yet), over on House of Turquoise, earlier this week. 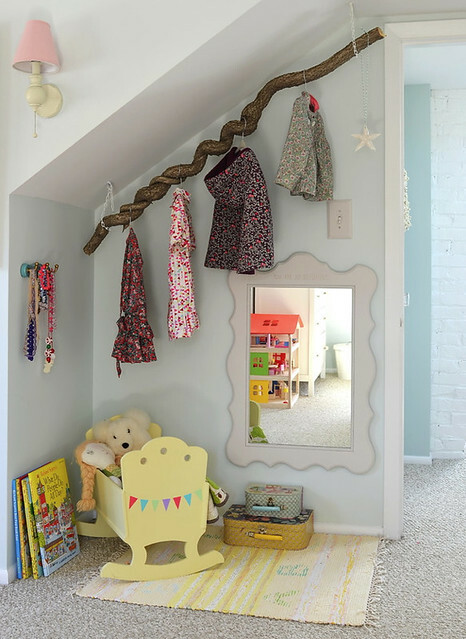 Such sweet whimsical details in this space, without giving you the overpowering sense of it being a little girl's room. 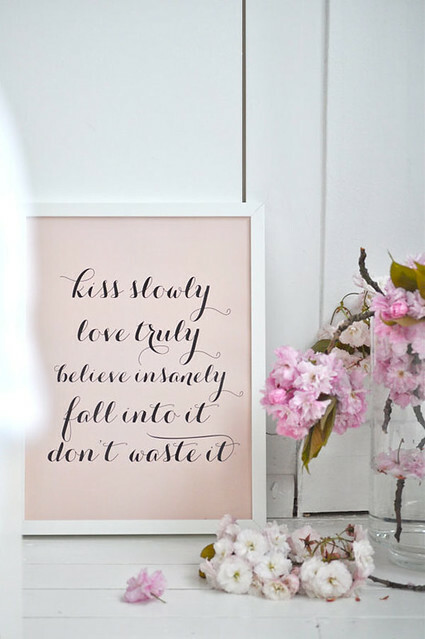 What a lovely print, and sweet reminder, from This is Glamourous this past week. I'm sure we all go through moments in our relationships while we take the other for granted. I think it's so important to step back, frequently, and remember what we love about the other person. Take time to cherish and nurture your relationships. Well, the last weekend of August is here. Can you believe how quickly that all went? I hope to soak up this final summer weekend - if the weather is kind. B has a boy's day planned tomorrow so Halle and I will be finding some fun girl things to do, on top of last minute preparations for our guests. Sunday, B's parents will arrive and all of the fun will start. Look for some more stuff from me in the coming weeks, as well as some guest posts from some wonderful bloggers who have offered to help out! Happy weekend everyone! One of the biggest issues with this space is the leaky roof, which means it remains empty at the moment. Since the weather out here is pretty damp, we don't want to put much in here at the moment and risk it getting ruined. At the moment, B has been in touch with the contractor who our landlords have put in charge of fixing the leaky roof. 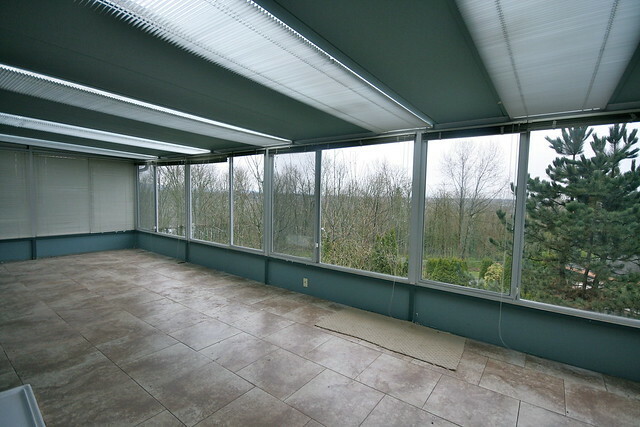 So, with a light at the end of the tunnel, I'm start to day dream about what I can do to this space to make it cozy and functional, without investing any money into structure, and purchasing pieces and accessories that will work when we move on from this home. This first photo struck my interest right away because of the colour of the room. 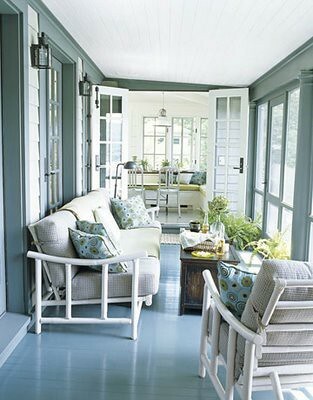 Identical to the blue our sunroom is painted. Though I am not a big fan of the colour, this room gives me hope that we can make some changes and live with the blue that is in there. Remember, our goal is to spend no money on the actual room itself, but rather just add furniture and accessories to spruce it up to our taste. If only we could invest more into the space! Isn't that wallpaper gorgeous? Well, even without the wallpaper, I'm really loving the stripes on the furniture, and have been considering doing just that on the two pieces that I have to recover for that space. 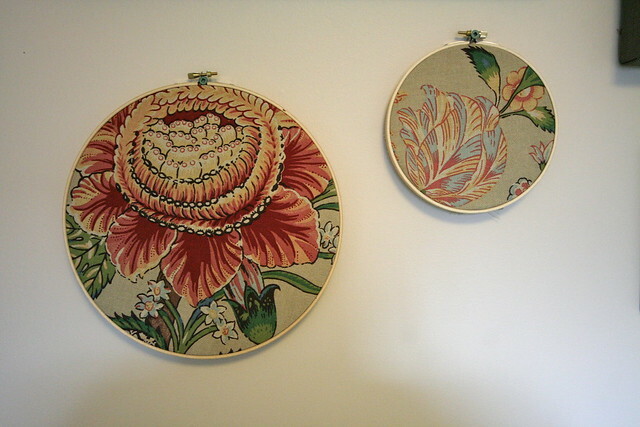 I'd like to keep it relatively neutral, like these pieces are, so that they are easy to move about in our next home. 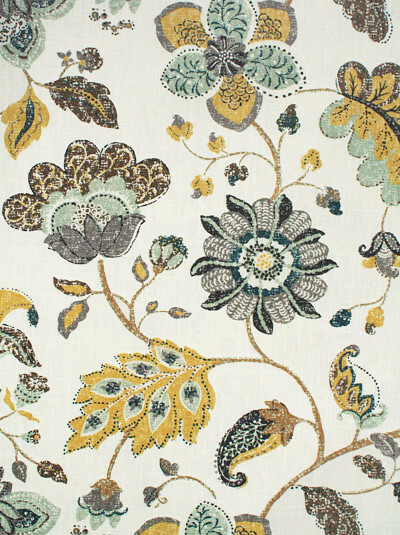 Also a fan of the neutral draperies, with just a bit of interest on the edging. The texture on the furniture is perfect, and the glass lamp is something I would love to add to our sunroom for evening lighting. What draws me most to this room is the variety of textures that are incorporated. 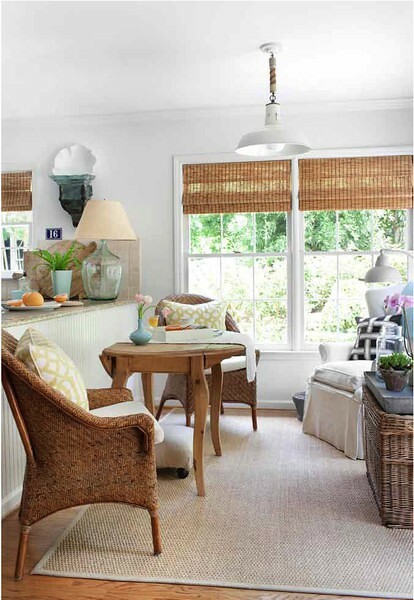 The bamboo shades, the wicker chest and chairs, the rug, the cord that the light fixture is hanging from. Though the space is incredibly neutral, it's grounded and warmed up through the use of the different textures. 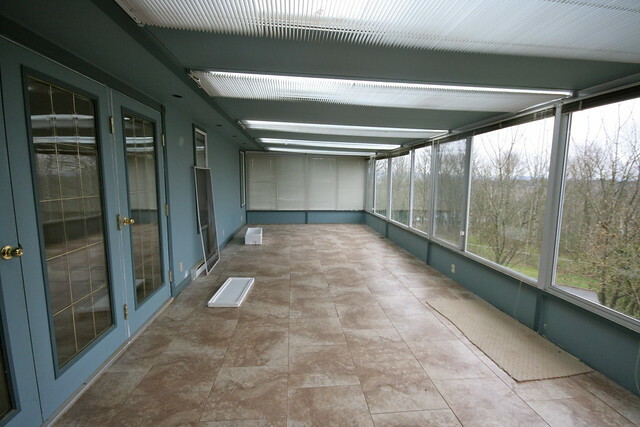 I would love to add some bamboo shades to our sunroom as well - though the investment may be a little too big for our rental. We'll see what I can come up with! The use of vibrant colours in this space excites me. Though we don't plan on painting the room (unless I just can't stand the blue), I am in love with the ceiling. The white wicker furniture is also fabulous, and what's more budget friendly than a couple of IKEA Lack tables placed side by side? I think we could handle that! 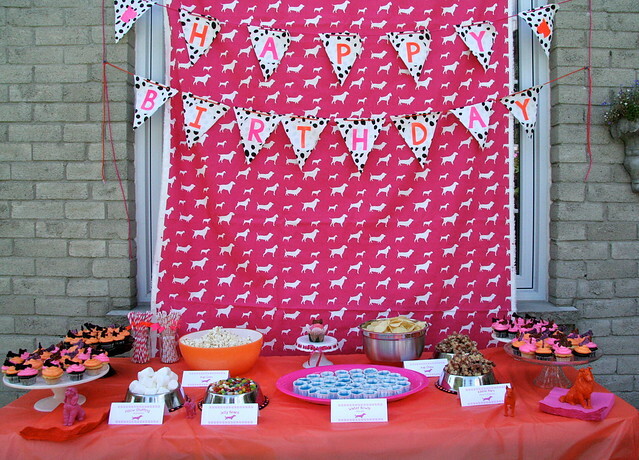 Those roller shades are also pretty cute. Who say's I can't make some budget friendly faux roman shades for our sunroom? There's a whole lot of potential hiding in this space, but of course, I'm still waiting on the contractor to come and patch up that leak for us. Once it's done, I hope to really get down to fixing the space up on a dime. 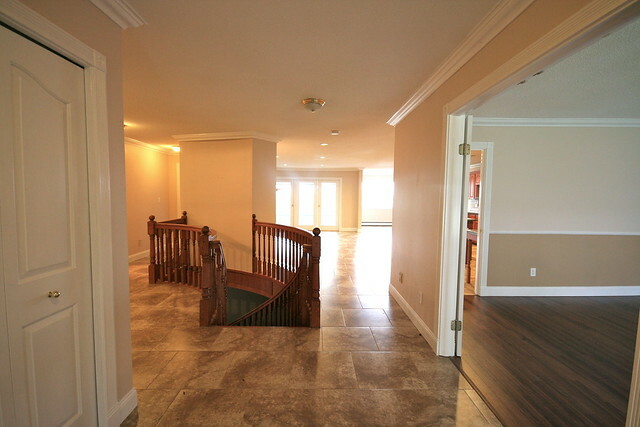 Is there a room in your house you are just dying to re-do? A space that has a ton of hidden potential that you need to tackle? 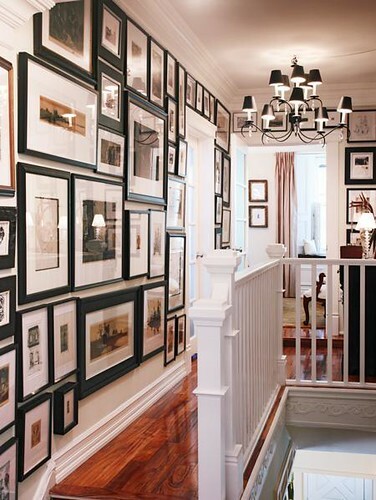 What are you favourite ways to spruce up a space on a dime? 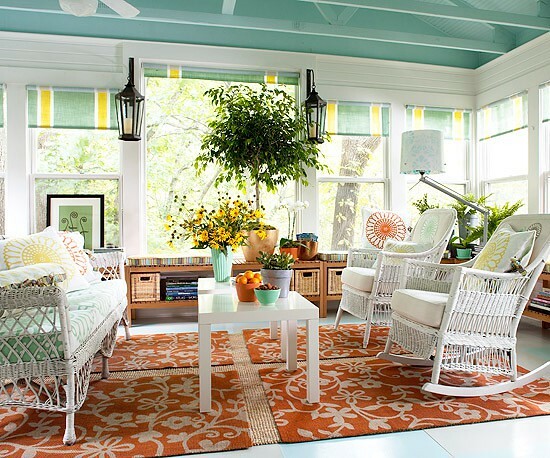 To see these pins, and other sunroom inspiration, check out my full Sunroom pinboard right here. Still not huge, but I was getting pretty tired of having all of these frames stacked up all over our kitchen and living room. Here's a more detailed look at what we have added to our wall. At the top is a family photo from Halle's newborn session, with Nicole from Bittersweet Photography. I love that picture of the three of us. The frame is from Indigo. I purchased it right after that session, specifically for that photo. Underneath is a cutting board I bought for B for Christmas last year from AHeirloom, over on Etsy. 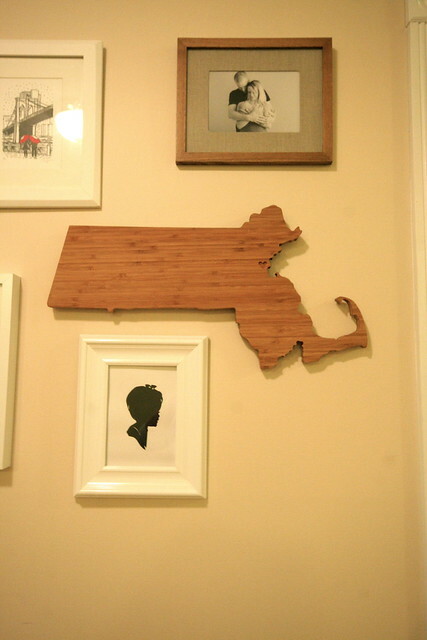 It's in the shape of the state of Massachusetts (his home state), with a little heart that resides over the Boston area. Since it is a cutting board, it actually came with no way to hang it, so we had to add some little pieces to the back of it to get it up on the wall. I'm glad we did and it can now be displayed in our home, rather than sit stored away in a box in the basement. At the bottom is Halle's silhouette. We had this done at Downtown Disney when we were in Florida this past May. The frame I picked up at Wal-Mart for only $9.99, and I really liked the shaped. I think it works perfectly with everything else we have on the wall. I also added one of my favourite prints, from Art Shark Designs. 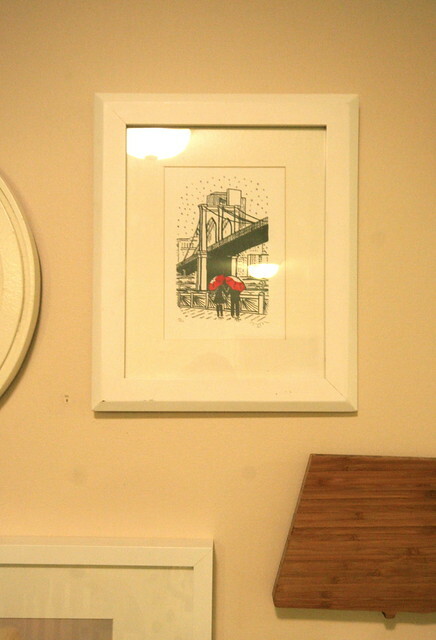 This print is a fun way for us to recognize how we met and fell in love in New York City. It makes me smile every time I look at it, and I am reminded of our time in that beautiful city together. One day we'll go back. That leaves our final three pieces. 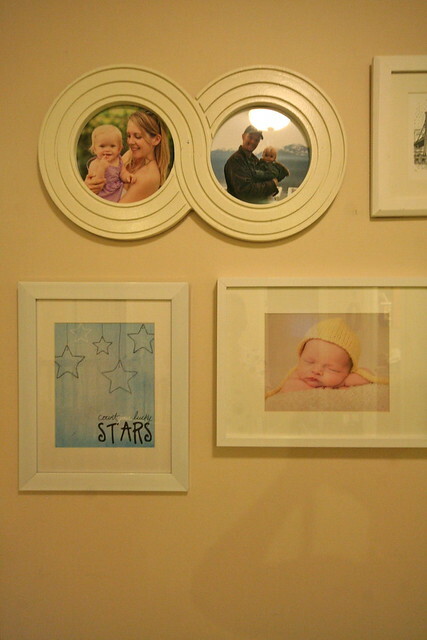 On the top is a frame from Poppy Tree Frames, which I had won in a giveaway back at the start of the year. It never made it onto the walls of our Toronto home, but here it is now, as what I see as the statement piece on our wall. I love what the shape symbolizes, and think it is perfect for family photographs. So, I included one of the photos of Halle and I from her one year session, and my favourite photo of her and B from our trip up to Whistler back in April. On the left is a print from Brittany's shop, that reads "count your lucky stars". I do every single day, but there's nothing wrong with a little reminder now and then. The last photo is pretty self explanatory. This is our favourite photo of our baby girl from her newborn session. 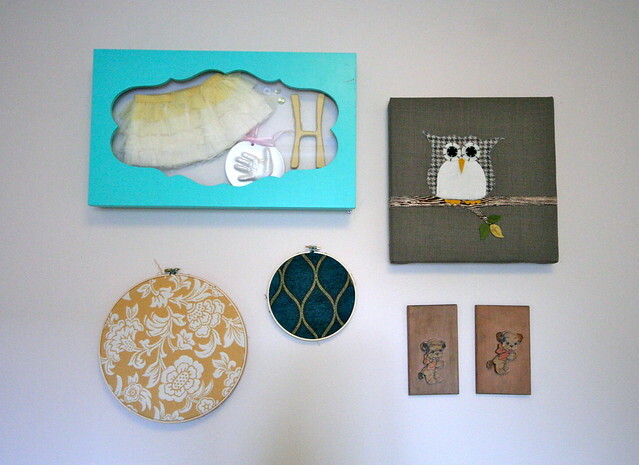 So there you have it, the start of our gallery wall. I'm sure I will be back with updates. I have a few issues with spacing in some spots, and some more that I would like to add to it. Right now, I'm just happy to have all of this on the wall (and off our counter). 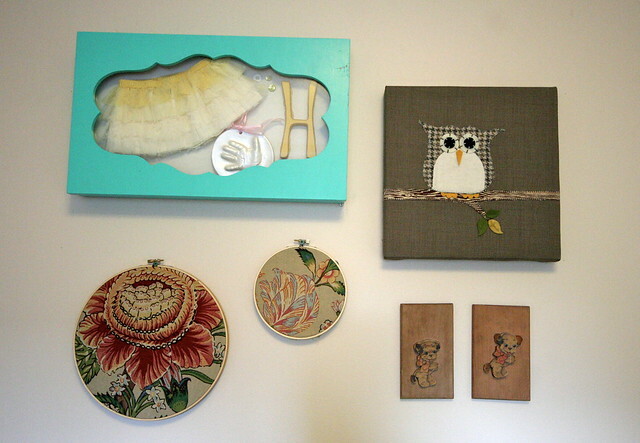 Just another small thing that is making this rental space feel more like a proper home. Happy Monday! We're back safe and sound in BC, and I have a full day ahead of running errands and unpacking. 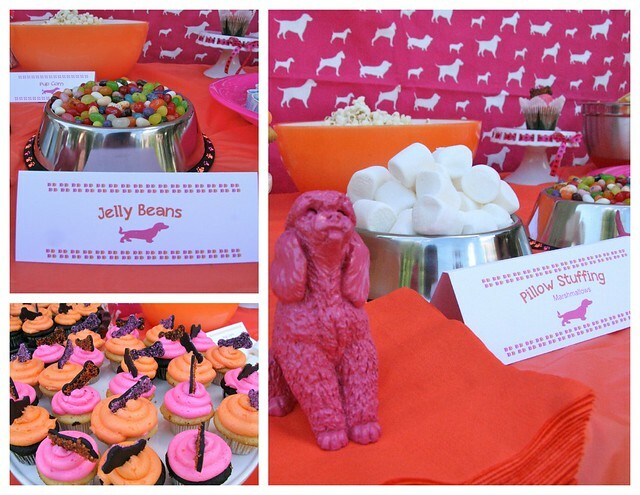 I could not let the day get away without sharing photo's of Halle's puppy party with everyone. 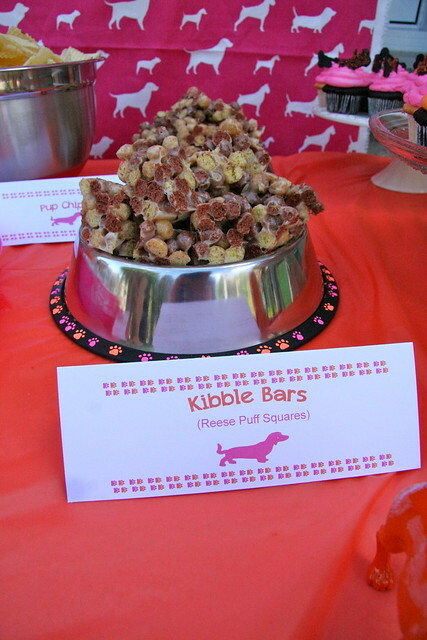 The cupcakes were made by my cousin, and she used some of her leftover bones to decorate the table. Cute! I'm glad we spray painted those Value Village dogs. They were the perfect weights for our napkins on a rather windy August afternoon. 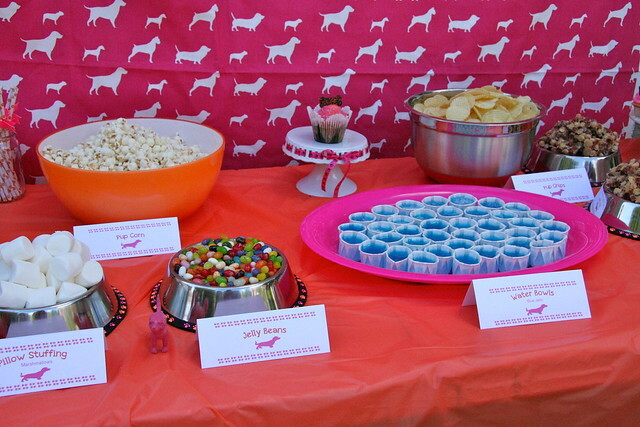 I had fun putting together and naming all of the treats for the party, and my Mom did a fabulous job creating the tent cards. They matched the water bottles that we had, and turned out so cute! Our utensils. 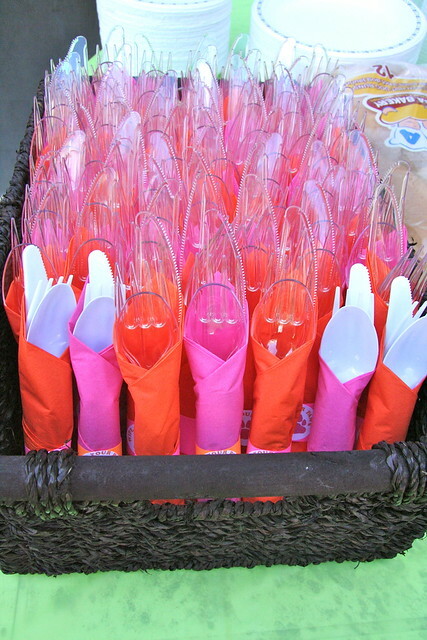 Rolled in pink and orange napkins, held in place by a sticker (designed again by my Mother) that read "Wipe Your Paws". Yet another detail I failed to capture. Halle's Time Capsule. 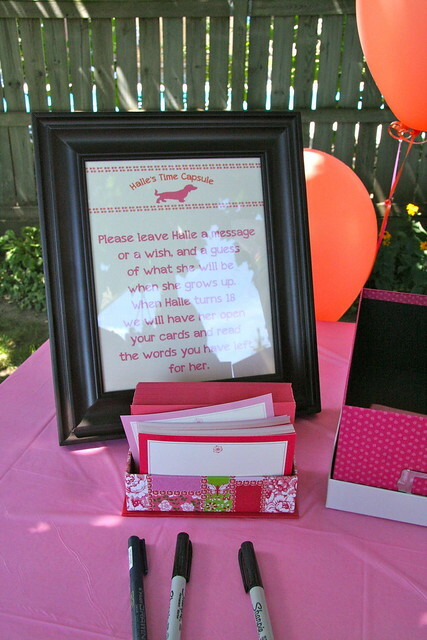 We left this on the gift table, and asked people to write Halle a message or wish, followed by what they believe she will be when she grows up. Our plan is to have her open this box when she turns 18, and read all of the notes from when she was 1. This box will also include the notes that were written to her at her Boston Tea Party. Displaying 12 Months of my baby girl. It's so crazy to see all of these photos lined up - her growth and changes so obvious. It's hard to remember that tiny dependent baby in the first photo. She is surely little Miss Independent these days. 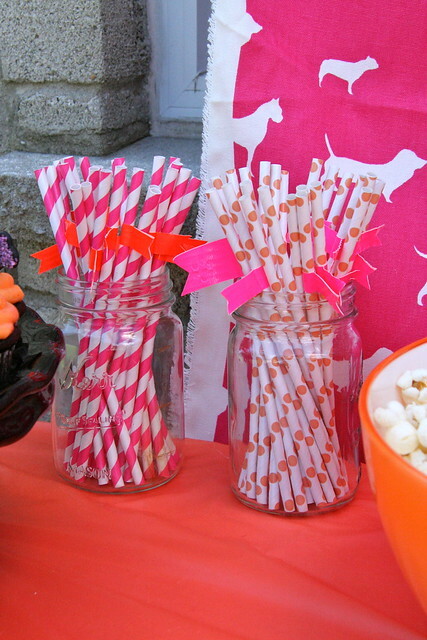 Drinking straws, with small orange and pink duck tape flags attached. 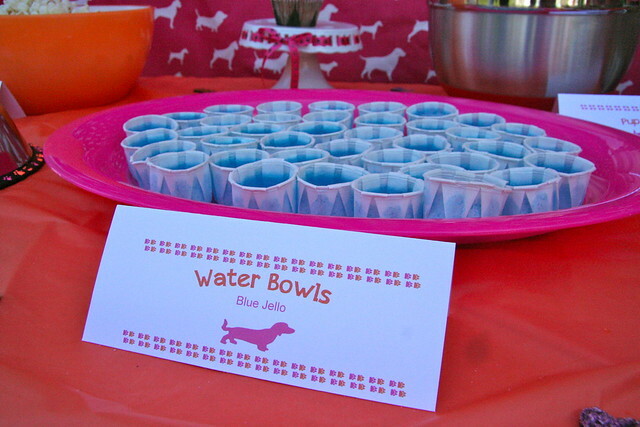 These were provided for the orange punch and pink lemonade that we made for the day. Yum! 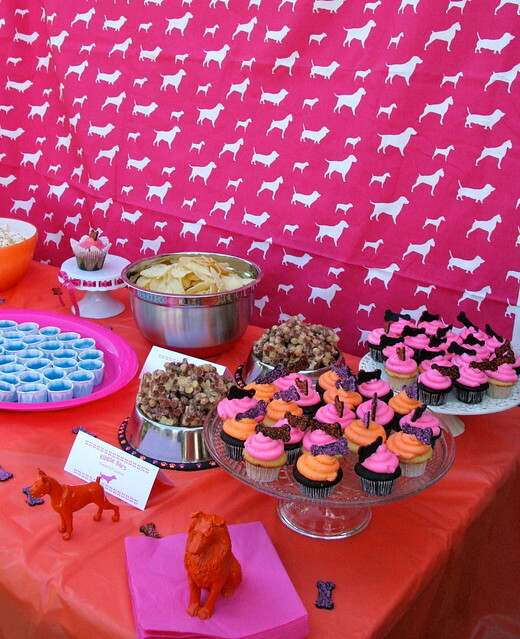 So there you have it, a small glance at how Halle's Puppy Party went down. We had such a fantastic day. Incredible weather and the best company we could've asked for. At the end of the day, the people who came were the most important part. Especially now that we live so far, it is great to get to see everyone and catch up when we were home, and what better way to do that than to get everyone together for a great celebration. What did you get up to on this lovely August weekend? 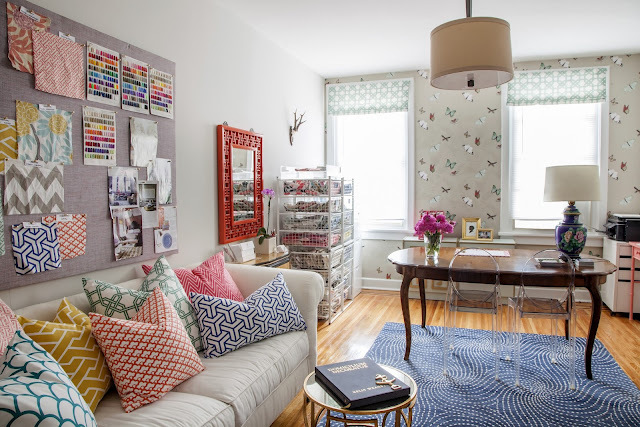 I almost fell off my chair (or rather, my parents couch) when I saw Caitlin's office on her blog last Friday. 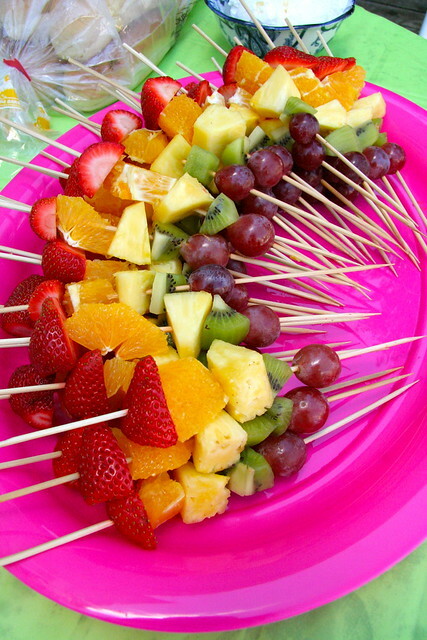 Seriously - L-O-V-E! 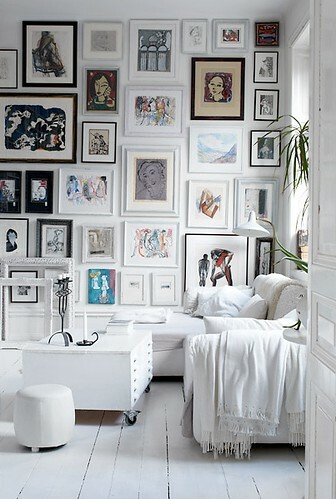 This lovely, white, serene home, caught my eye over on desire to inspire on Sunday. Each room makes me love it more - what do you think? 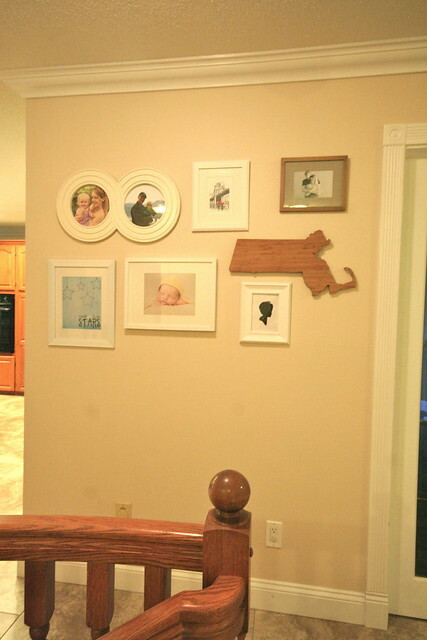 Love this sweet nursery, from On to Baby yesterday. The colours are great, and some of the storage solutions are inspiring me for Halle's new room in BC. If you are looking for something more from me today, then be sure to pop on over to Wicked & Weird, where I am posting about what "Going Home" means to me. Well, today should be extra busy. I'm hoping to sneak in a trip to the CNE today with B and Halle, a family tradition of mine since I was a child. If we do manage to visit, it will be pretty short, as I have a lot of last minute items to cross off my list before Halle's party tomorrow. Yes, her final party has arrived and I'm so excited to share all of the details with you next week. I've been working so hard, and I hope that it shows tomorrow. What do you have planned for this lovely August weekend?